(Nanowerk News) Lawrence Livermore National Laboratory scientists and collaborators are developing a new military uniform material that repels chemical and biological agents using a novel carbon nanotube fabric. The material will be designed to undergo a rapid transition from a breathable state to a protective state. The highly breathable membranes would have pores made of a few-nanometer-wide vertically aligned carbon nanotubes that are surface modified with a chemical warfare agent-responsive functional layer. Response to the threat would be triggered by direct chemical warfare agent attack to the membrane surface, at which time the fabric would switch to a protective state by closing the CNT pore entrance or by shedding the contaminated surface layer. The highly breathable membranes have pores made of a few nanometer-wide vertically aligned carbon nanotubes that are surface modified with a chemical warfare agent-responsive functional layer. "The uniform will be like a smart second skin that responds to the environment," said Francesco Fornasiero, LLNL's principal investigator for the Defense Threat Reduction Agency (DTRA)-funded project. "Without the need of an external control system, the fabric will be able to switch reversibly from a highly breathable state to a protective one in response to the presence of the environmental threat. In the protective state, the uniform will block the chemical threat while maintaining a good breathability level." High breathability is a critical requirement for protective clothing to prevent heat-stress and exhaustion when military personnel are engaged in missions in contaminated environments. Current protective military uniforms are based on heavyweight full-barrier protection or permeable adsorptive protective overgarments that cannot meet the critical demand of simultaneous high comfort and protection, and provide a passive rather than active response to an environmental threat. To provide high breathability, the new composite material will take advantage of the unique transport properties of carbon nanotube pores, which have two orders of magnitude faster gas transport rates when compared with any other pore of similar size. "We have demonstrated that our small-size prototype carbon nanotube membranes can provide outstanding breathability in spite of the very small pore sizes and porosity," said Sangil Kim, another LLNL scientist in the Biosciences and Biotechnology Division. "With our collaborators, we will develop large area functionalized CNT membranes." Biological agents, such as bacteria or viruses, are close to 10 nanometers in size. Because the membrane pores on the uniform are only a few nanometers wide, these membranes will easily block biological agents. However, chemical agents are much smaller in size and require the membrane pores to be able to react to block the threat. To create a multifunctional membrane, the team will surface modify the original prototype carbon nanotube membranes with chemical threat responsive functional groups. The functional groups on the membrane will sense and block the threat like gatekeepers on entrance. A second response scheme also will be developed: Similar to how a living skin peels off when challenged with dangerous external factors, the fabric will exfoliate upon reaction with the chemical agent. In this way, the fabric will be able to block chemical agents such as sulfur mustard (blister agent), GD and VX nerve agents, toxins such as staphylococcal enterotoxin and biological spores such as anthrax. The project is funded for $13 million over five years with LLNL as the lead institution. The Livermore team is made up of Fornasiero, Kim and Kuang Jen Wu. Other collaborators and institutions involved in the project include Timothy Swager at Massachusetts Institute of Technology, Jerry Shan at Rutgers University, Ken Carter, James Watkins, and Jeffrey Morse at the University of Massachusetts-Amherst, Heidi Schreuder-Gibson at Natick Soldier Research Development and Engineering Center, and Robert Praino at Chasm Technologies Inc.
"Development of chemical threat responsive carbon nanotube membranes is a great example of novel material's potential to provide innovative solutions for the Department of Defense CB needs," said Tracee Harris, the DTRA science and technology manager for the Dynamic Multifunctional Material for a Second Skin Program. "This futuristic uniform would allow our military forces to operate safely for extended time periods and successfully complete their missions in environments contaminated with chemical and biological warfare agents." 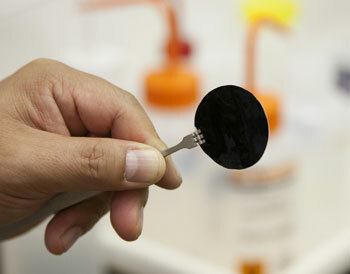 The Laboratory has a history in developing carbon nanotubes for a wide range of applications including desalination. "We have an advanced carbon nanotube platform to build and expand to make advancements in the protective fabric material for this new project," Wu said.